De Blasio closes shoddy shelters, and eyes a bigger fix. Life for homeless people in New York got better just a week into the de Blasio administration, as the new mayor restored an emergency provision that relaxed shelter entrance requirements when temps on the city’s streets dropped below freezing. Mayor Bloomberg, who in 2004 made a bold promise to dramatically reduce homelessness but pursued several hard-hearted and light-headed policies, had eliminated those “code blue” rules a year earlier. Indeed, while the situation facing 400 kids at the Auburn Family and Catherine Street shelters will improve, the fact that 22,509 children (and 29,752 other people) are in city shelters in the first place is the real challenge facing the administration. And meeting that challenge is another subplot in the dance of Mayor de Blasio and Governor Cuomo. Already the two Democrats—one coming off a huge landslide win, the other aiming for one in November—are jousting on the minimum wage and taxes on the wealthy and joining up to push for a federal waiver to save Brooklyn’s hospitals. The waiver came through. The other issues remain on the table. While homeless numbers were high throughout the Bloomberg years, they spiked after the city terminated its Work Advantage program—a temporary rent subsidy for formerly homeless people. After Work Advantage disappeared, there was no place for people to go after living in the shelter. With the exit door blocked, the population inside swelled. Many advocates had disliked Work Advantage because of its very short, one or two-year duration, which they argued was not enough time for formerly homeless families to find a way to pay their own rent. The Cuomo administration evidently shared some of those misgivings, and cut state funding for Work Advantage. The Bloomberg administration followed suit, and the program vanished. Now Cuomo’s people and the de Blasio administration are talking about creating a new subsidized housing program. One question is how much the new program will resemble the disliked Work Advantage scheme. Another is whether, as part of the deal with the state, de Blasio will make good on a campaign pledge to restore a priority status for homeless shelter residents applying for Section 8 or public housing. Bloomberg eliminated that priority on the idea that it drew into the shelter system people looking for a fast-track to a cheap apartment. 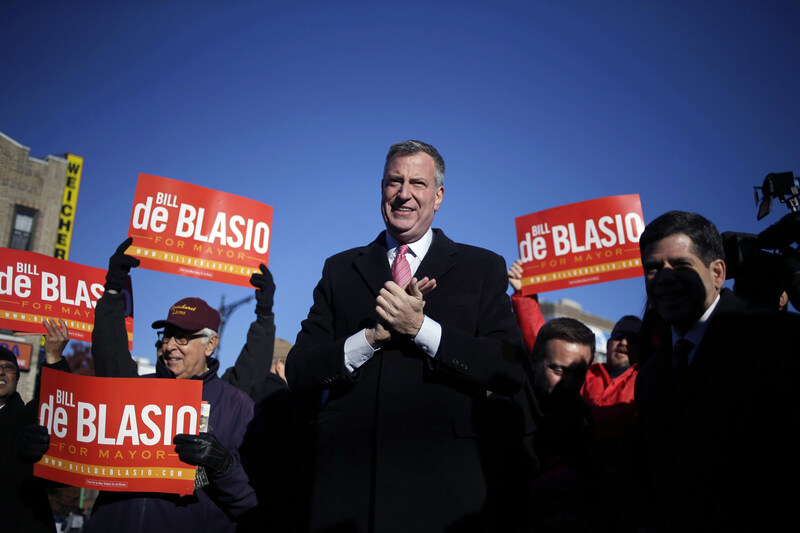 De Blasio said during the campaign that he’d restore the priority, but has not done so yet. The city is less likely to depend on federal housing programs as a solution because of the dwindling supply, Mr. de Blasio said. “It will be a tool we use as needed, but I think the central thrust has to be getting at the root causes,” he said. It’s true that neither Section 8 nor the New York City Housing Authority (NYCHA) are on rock-solid ground, and both already have lengthy waiting lists. But neither program is melting away anytime soon. De Blasio took a big step toward shoring up NYCHA by eliminating some fees the authority was forced to pay the city. No, public housing and Section 8 aren’t going to solve New York’s homeless crisis, but together they turn over around like 8,000 apartments a year. Families—some 10,000 or them—make up most of the city’s shelter population, so even if a minority of those slots went to shelter residents, it’d make a big difference. It’s possible that the issue of homeless access to Section 8 and NYCHA is part of the discussions with the state about a replacement for the Work Advantage program. Those discussions have to wrap up before the state passes its fiscal 2015 budget, which is supposed to be by April 1. But that alone won’t put the homelessness issue to bed. De Blasio said today that a broader effort (“Greater supply of affordable housing. Pushing up wages and benefits. More preventative efforts.”) is needed to really reverse the tide of homelessness. Pushing up wages—at least the minimum wage—is, of course, another gambit in the Cuomo–de Blasio chess match.